A portrait of June’s best friend from her college days in Rhodesia. It was painted by June’s then husband in the lounge of their Tudor home in England. 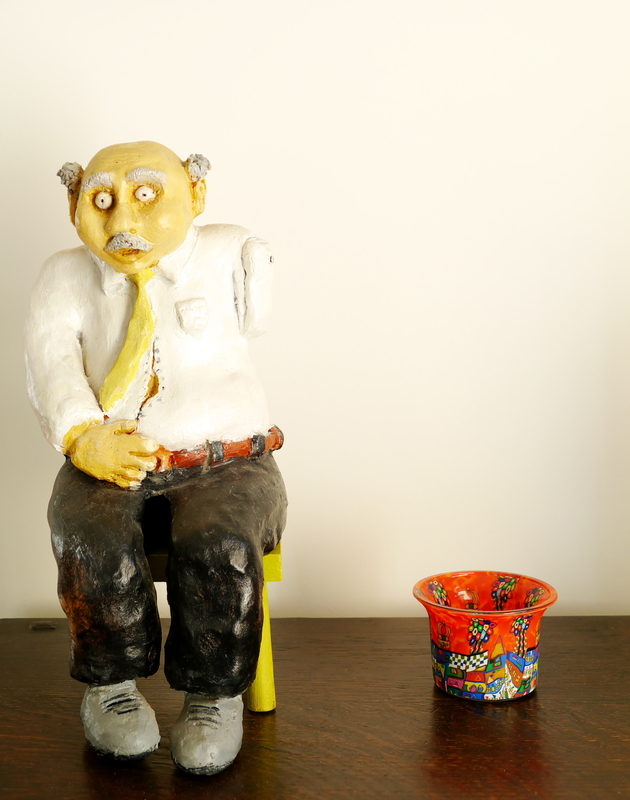 The old man is a piece of ceramic crafted by my son when he was in year 10. My son, Keir then went on to become a ceramist and now owns Angus and Celeste with his partner Asha . 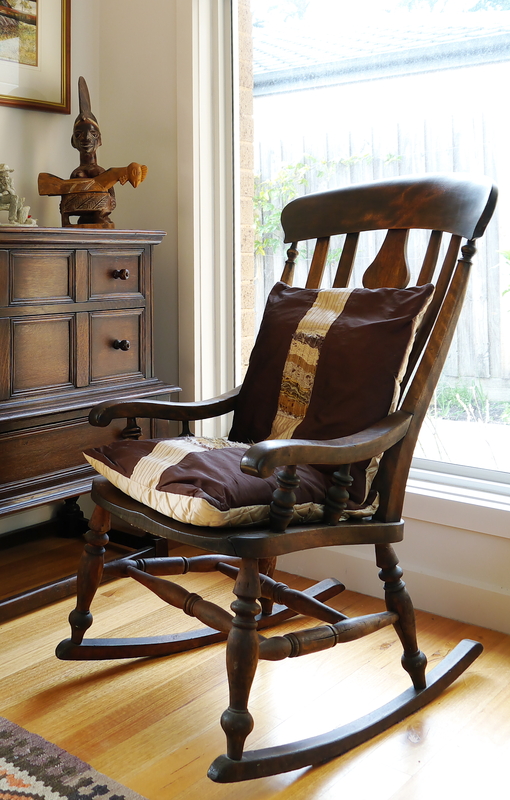 My old Lincolnshire Rocker is my favourite. I found it in a second hand shop in Abbotts Langley in England 33 years ago. It cost me £5. I had just left Zimbabwe via South Africa. It was the first truly English ‘thing’ I bought. 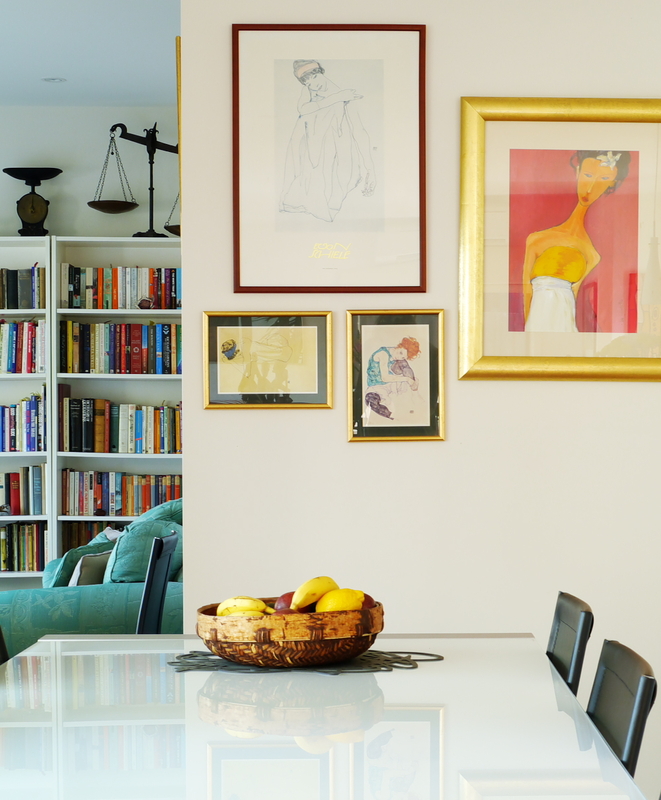 This room is an open plan living space that encompasses a kitchen, lounge and dining room. 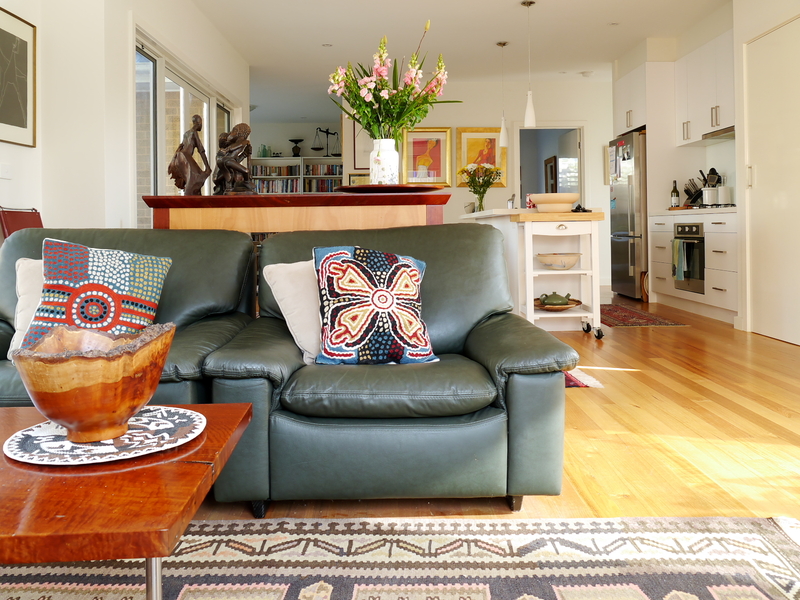 Coming from a large 5 bedroom, two lounge, family room/ meals area home, the challenge was to condense everything that was meaningful to me into this space. I use it. I live on my own. 2. What do you do (or did you do) for a crust? I am now supposed to be retired. I was for 33 years a management development and communication consultant. I had my own business and worked throughout the Asia Pacific. Now, I work when I choose to as an executive coach and learning facilitator. Life and reflection goes on in the room. I am happily single. The room is not filled with children or a partner and his bike. It is a conversation hub mainly for me and friends. It is where I can have my book club. It is somewhere I can read, relax, meditate and from where I can review and conduct my life. I can walk around naked, do the ironing or cook up a storm. My mother used to say I was a Welsh Witch. That’s really difficult to decide, because I have lived in four different countries and visited many others and everything has a story. 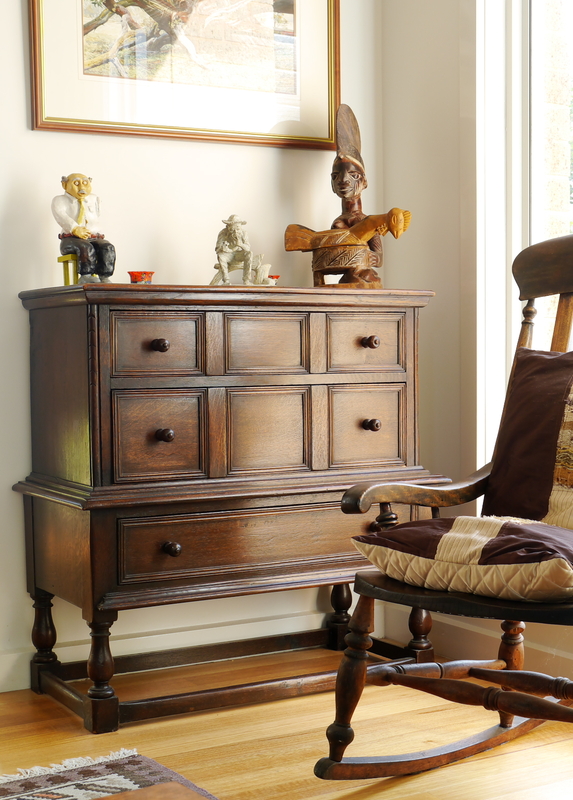 Perhaps the lounge part of the room and my old Lincolnshire Rocker is my favourite. I found it in a second hand shop in Abbotts Langley in England 33 years ago. It cost me £5. I had just left Zimbabwe via South Africa. It was the first truly English ‘thing’ I bought. The seat was cracked even then and the rockers were worn. It has obviously seen life – like me. I love sitting in it, in the sun when the light streams through the window. That sounds so clichéd. I may have to get a new lounge suite some time – but no I am quite content the way it is. It reflects who I am, my life and my interests. I love this room because I didn’t go out and buy anything new for it, except the dining table. Every piece in it has a story. 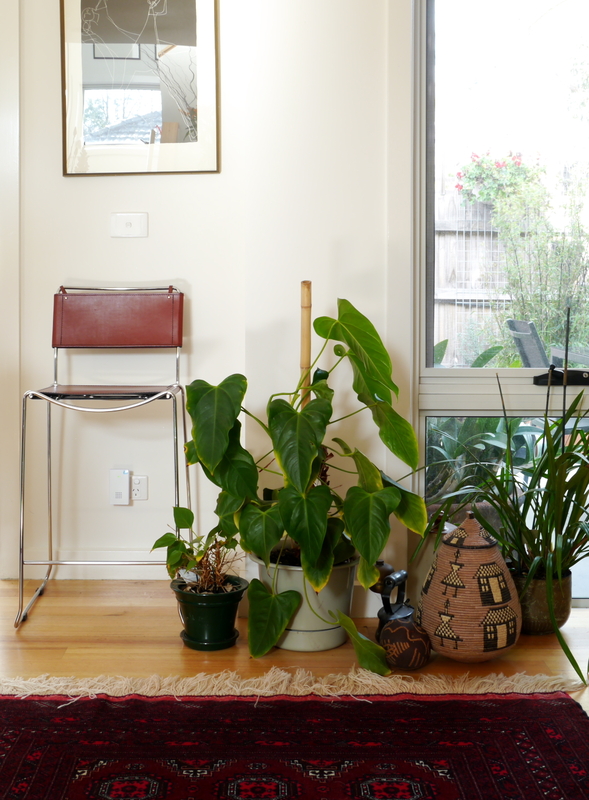 It allows me to bring the outside in. It doesn’t hold any bad memories. It is private. See… no curtains. 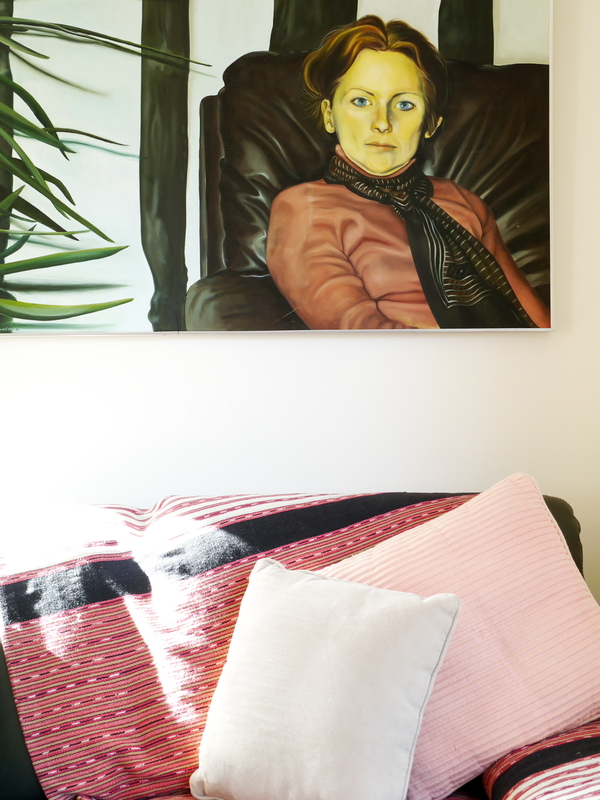 When I sit in this room – with the rocking chair and the portrait of my best friend from my college days, it reminds me of the wonderful, almost Dickensian Christmases, and the time I spent living in a farm house (built in 1628) in England. 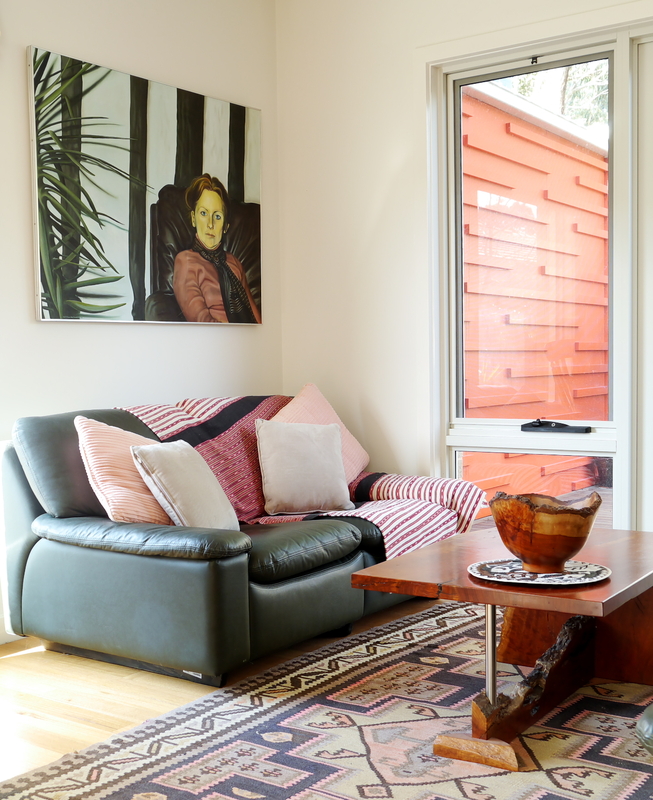 It was a different lounge room, same furniture; it was a different era, less complicated and very rural. But I don’t tend to dwell on memories of the past. It is the evocative sense of peace that I feel in this space which is important to me. 20 Aug	This entry was published on August 20, 2015 at 8:00 am. 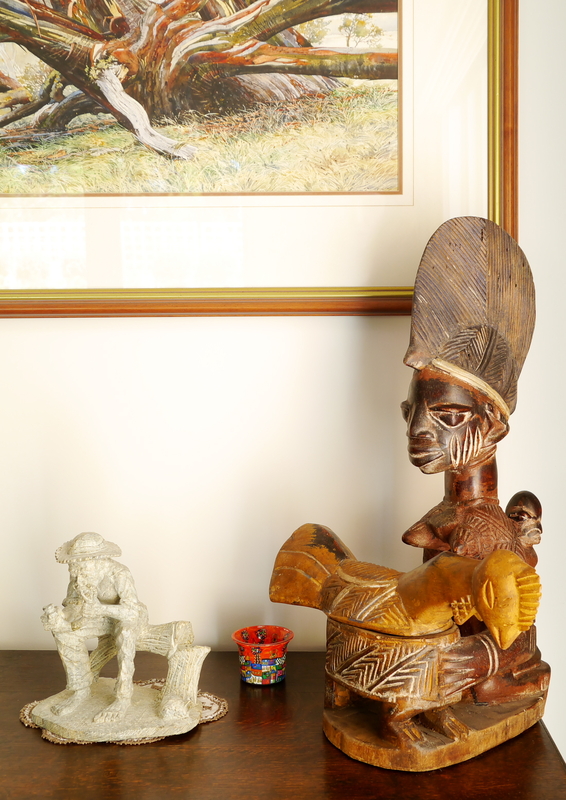 It’s filed under Uncategorized and tagged African art, Angus and Celeste, Antiques, Artwork, Indoor plants, Living room, Rocking chair. Bookmark the permalink. Follow any comments here with the RSS feed for this post. Your home is beautiful, June. A bright, happy place yet retaining a sense of peace. Also loved the views from the windows. It looks a wonderful place to have started a new chapter in your life. May the memories created in your new environment all be happy ones. Well done Kate, you did a good job and made me feel relaxed. Glad you like it June. 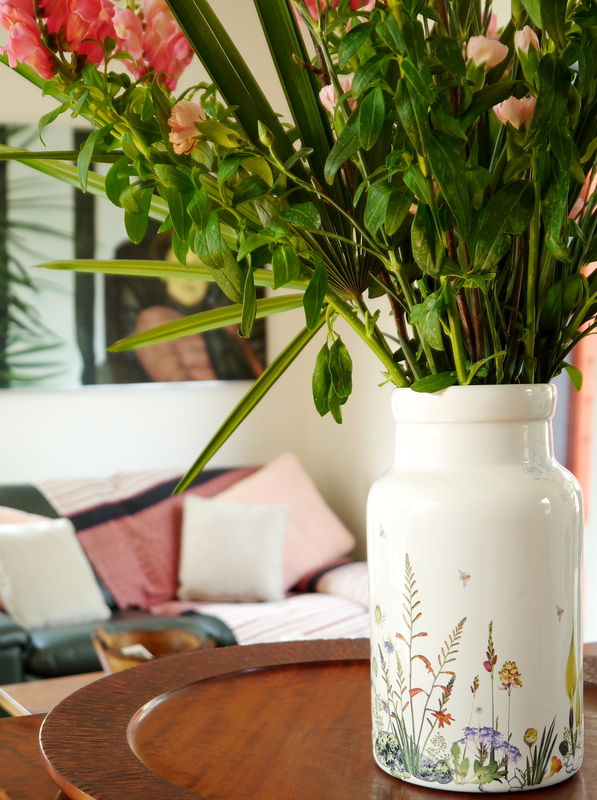 It was lovely spending the morning getting to know you and your beautiful space.